Source: Cargotec’s interim report January–March 2019. The text is updated quarterly. Developments in the global economy and cargo flows have a direct effect on Cargotec’s business environment and customers’ willingness to invest. A slowdown in global economic growth could reduce the growth in container traffic. Furthermore, the consolidation of ship companies and container terminal operators as well as the relatively low penetration of automation technology could postpone the customers’ investment decisions regarding container handling automation. Project executions may face risks related to schedule, cost and delivery guarantees. Furthermore, potential bottlenecks in the supply chain could postpone deliveries and have a negative impact on sales and results. Also challenges related to the availability of skilled workforce and the company’s ability to retain it could impact operational performance negatively. Uncertainty may be increased by risks stemming from political instability, volatility on the currency and raw material markets, or from the financing sector. In addition, a trade war could have an impact on global flow of goods and therefore on the demand of Cargotec’s solutions. Hiab’s demand is impacted by the development of the construction market. A significant share of Hiab’s orders are from the United States. Even though the cash flows are hedged for the existing order book, the weakening of the US dollar in the longer term could weaken Hiab’s results. Greater difficulty in obtaining financing would weaken customers’ liquidity and investments. Cargotec is involved in certain legal disputes and trials. The interpretation of international agreements and legislation may weaken the predictability of the end results of legal disputes andtrials. The demand for Cargotec’s load handling solutions continued to be strong during the first quarter of 2019. Orders received grew in total by 18 percent compared to the comparison period, and the growth was evenly spread between all of our business areas. Sales developed favourably as well,increasing by 11 percent. Our comparable operating profit remained at the comparison period’s level. 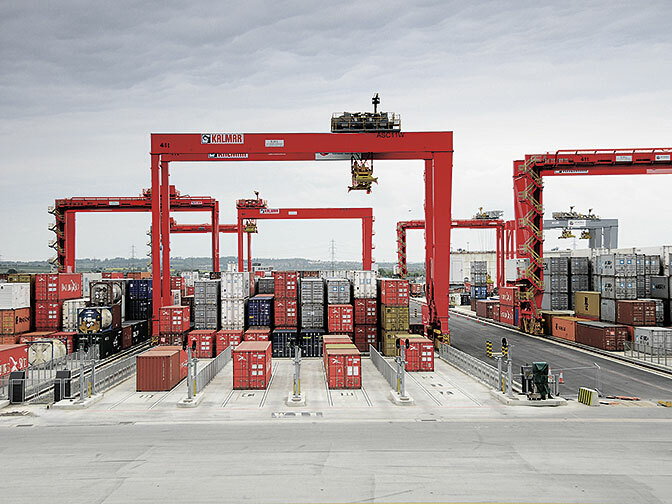 Kalmar’s profitabilityimprovement was driven by higher sales. The sales grew also in Hiab, but especially the challenges in the supply chain led to a decline in the comparable operating profit compared to the first quarter of 2018. We continued our efforts to solve these issues, and believe that Hiab’s performance will improve during the second half of 2019. Despite the increase in MacGregor’s orders received, the market situation remains difficult. Nevertheless, MacGregor’s comparable operating profit remained positive. The development in our service and software business was good during the first quarter. Services ales grew by five percent and software sales by 18 percent. During the quarter, we strengthened our software offering by acquiring the US-based Cetus Labs, Inc., which offers a cloud-based Octopi terminal operating system (TOS) for small container and mixed cargo terminals. With the addition of Octopi to its software portfolio, Navis is better positioned to support thousands of smaller terminals around the world that are eager to modernise their terminal operations, yet lack the technology infrastructure or technical expertise required to support a full-scale Navis N4 TOS deployment. Service and software sales constituted around one third of our sales. Our target is to increase the annual sales of our service and software business to 1.5 billion euros.